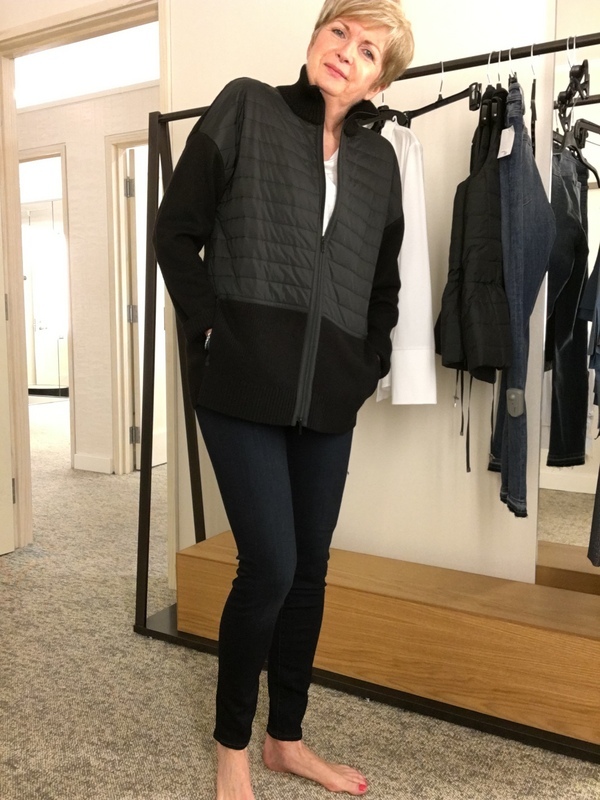 Earlier this week, I visited my buddy Liz at Nordstrom for a preview of their Anniversary Sale. And let’s just say that “shoppiness ensued.” I love that line from Christopher Brookmyre’s book When the Devil Drives. The fashion blogosphere has been buzzing about the Nordstrom Anniversary Sale for the past week or so. So much buzzing that you’re probably sick of hearing about it. I was a slow convert to the idea of shopping for fall in July. The first year after Nordstrom opened in Ottawa, I told Liz that I simply wasn’t ready to shop for fall. I hadn’t done my inventory, perused the new fall trends, or made my list. But the lure of big discounts on the new fall stock was too tempting. And I found a few really great pieces. Last year I was ready, I did all my homework, but sadly found nothing on my list which was on sale. Although I did buy my Veronica Beard suit which has become a staple in my closet. 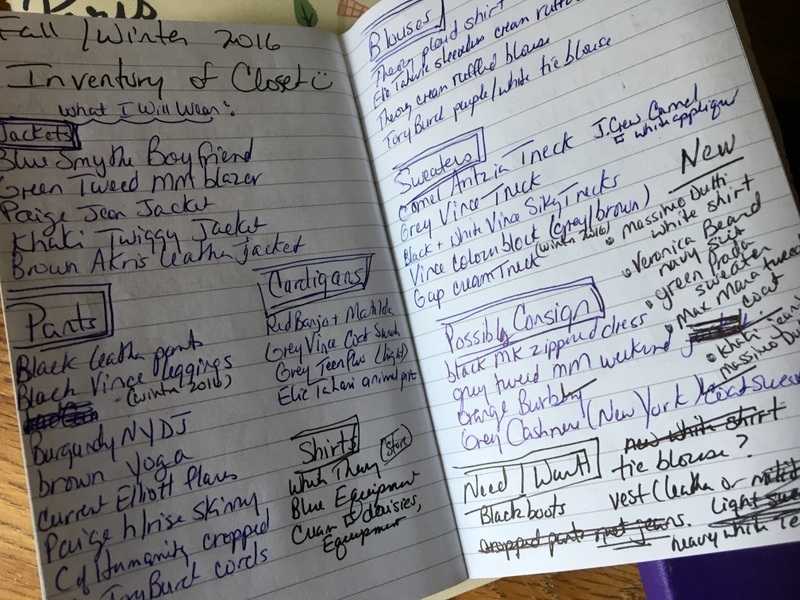 This year, I threw all my fashion caution aside, did no homework, other than looking at my list of what I already own in the way of fall and winter pieces. But, aside from that minimal preparation, I decided to wing it. Shocking, eh? I’m tickled with the results of my shoppiness. See the little bit of bling on the neck of this shirt? And I’m pretty pleased with the fruits of my labour this year. 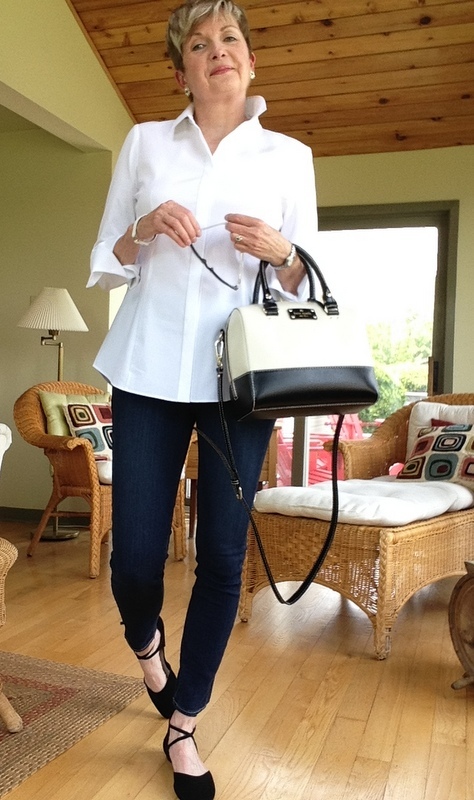 I stuck to basics, and focused on jeans and possible tops to wear with jeans. And maybe a light sweater to wear under the tweed Max Mara coat that I bought in New York last fall. My “inventory” from last year. I bought this lovely white shirt from Lafayette 148. I don’t usually shop in the Lafayette section of the store. I guess I’ve always considered the brand a bit stuffy, a bit too classic, and not fashion forward enough. Ha. That’ll teach me. 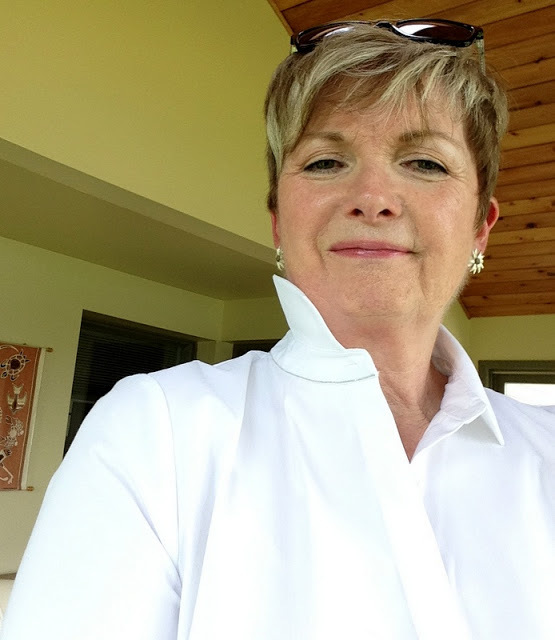 Liz says that their shirts are made of high quality Italian cotton shirting, and are similar in design (no one is using the term “knock-off”) to some of the Fabiana Filippi designs. I love Fabiana Filippi, love her ads in Vogue, lust after her designs, but can’t afford them. So this was music to my ears. I loved this shirt even before Liz showed me the similar design in FF. I like the small collar which stands up nicely, the sleeves which are of soft stretchy jersey, different in texture than the cuffs and the rest of the shirt. And the teensy bit of bling in the narrow silver chain detail around the neck. You can see this detail in the first shot above. If I’m going to don this shirt with jeans, I prefer my collar up slightly and my sleeves rolled. The jeans I’m wearing I also picked up at the sale. They are Paige Hoxton Ankle, high-rise skinny. These jeans just slide on, and feel wonderful. The high waist smooths out the bumps and jiggly bits. Love that. They’re quite light weight, and will be great for fall and for summer. I rolled the bottoms in the store, but prefer them unrolled, here, with my Paul Green flats. The rolled cuff with all those laces looks a bit too fussy to me. So I’m ready for lunch with a friend on a patio downtown. The new me, the retired me. Great shirt, great jeans, teensy bit of bling, some accessorizing, but mostly letting the shoes and bag handle that. Off I go. But before I do, here’s the other two items I bought at the Anniversary Sale. Another pair of jeans. Paige high rise, full length skinny to replace the ones I bought two years ago and have worn out. And this black sweater/jacket from Lafayette 148. This zippered jacket is mostly knit, except for the quilted front. I love the cut; it falls straight from the shoulders. And will be a great fall jacket. Good for crisp days in Ottawa, or for travel. This is the shot I took in the dressing room at Nordstrom. I didn’t have time to style it yesterday for this post. So we’ll just have to imagine how it will look with a really casual tee underneath, my black leather trousers, and my black Stuart Weitzman boots as Hubby and I head out for dinner. Or with my boots, and these jeans… on a train, somewhere in England, in October. I’m excited about my fall trip. My friend Elizabeth and I, sans spouses, gadding about for two weeks. Shopping. Drinking tea. Enthusing about all things English. What could be better? Looking like I have a crick in my neck in the dressing room at Nordstrom. I did some research on Lafayette 148 this afternoon. I had a really good poke around their website, and listened to a few of the short videos about the company. I’m impressed. I like that the co-founder and CEO Deirdre Quinn says that they “want to dress every woman.” She says they make clothing in 58 sizes. Huh. I still think that some of their lines are a bit too “worky,” too “drapey,” or too conservative for me. But I may take a closer look next time I’m in Nordstrom. And not write off Lafayette 148 as I have in the past. But back to Wednesday. After the shoppiness subsided, and I had chosen the pieces I wanted, I decamped to the restaurant where I was meeting my friend Krista for lunch. The restaurant was crowded, but Krista had a table, next to three very distinguished looking older ladies. Me- I love that sleeveless, black dress with that scarf, Krista. You do scarves so well. Krista- Really, do you think? I always feel with my hair this long it’s too much. You know? Me- It’s perfect. The black linen dress, black and cream patterned scarf, and those white Birkenstocks… perfect. Krista- I’m a bit disappointed with these sandals, though. See where the patent leather is peeling a bit? Holding up her foot a little under the table. And as we continued to discuss sandals and scarves, what I had just bought, what she bought at MAC cosmetics that morning, what she will be looking for when she meets with Liz next week, I noticed looks of bemusement on the faces of our neighbours. And I wondered what they were thinking. Maybe that we were a bit too mature to be gushing over clothes? That the girly chit chat was something we should have out grown long ago? Especially me, seeing as Krista is only in her forties. And I felt a bit defensive. After all, Krista and I are not flibbertigibbets; we’re smart, accomplished women. I wanted to throw out a few Shakespeare quotes to tip the balance of the impression we seemed to be making on these women. You know, some erudite reference to the use of clothing imagery in King Lear. Or maybe a quip that, like Feste in Twelfth Night, I look in the mirror at myself in skinny jeans and notice the “whirligigs of time.” Something relevant, and deep, that I could slip seamlessly into the conversation. And then I wondered if their looks might be ones of complicity, and not of criticism. Of recognition. Looks that said: Oh yes, we too know those lovely, easy conversations we women have with our girlfriends. Even our very smart and accomplished girlfriends. The girly chit chats we have despite the fact that we left girlhood behind years ago. Utterly unselfconscious, nonjudgmental conversations which sustain us, and give us so much pleasure. And then the waitress delivered a gigantic piece of chocolate cake to their table, with three forks. One of them chuckled. And, Krista and I looked over and smiled back. Ah yes. Definitely complicity… not criticism. Because who doesn’t love a long, chatty lunch with a like-minded friend, especially after a period of very fruitful shoppiness? So what about you, my friends? Been shopping lately? Lunching with like-minded girlfriends? The ones who never ever assume that you’re an airhead just because you gush over clothes. Another super post, Sue. Sometimes it is good to talk girlie, to let off pent-up girlsworld steam, especially when there has been much shoppiness. We don't have a UK equivalent of that nationwide-wide Nordstromminess, maybe the Next sale has a tiny bit of a buzz. But not much. As I rummaged through the exciting Burpee sales rack I spotting an absolute gem, the one that screamed "I am for YOU!". You are coming to England! Can I ask when, and where? Thanks, Mary. Yep, my friend and I are planning to be in England in October… 4-20th so far. We are still in the planning stages, but hope to stay in London for a few days then head south to Eastbourne (Eliz has family there) then Bath, somewhere in the Cotswolds, maybe. Then we want to head north.. I want to go to Chatsworth…that Mitford obsession. SAnd back to London. But all this is still rough… we're working out the details. Any suggestions for places we might want to see in the Cotswolds or where to stay (towns) around Chatsworth…would be gratefully received. We are doing all public transport… so we'll be a bit limited. You come to England at a beautiful time. Can I just warn you to check the opening times of places like Chatsworth because they often shut in the winter months and it is a long way to come to be disappointed. A friend of mine came all the way from Australia…to find Chatsworth closed in January. Derbyshire is a handsome county but not one that many Brits will actually have visited. There is a pretty little town called Melbourne which is worth a visit and then you can go walking in the Peaks. Also Eyam, the plague village which is most interesting. If you did decide to rent a car you would be quite safe driving around here as long as you kept off the motorways. The roads are glorious and often quite empty. Can I recommend booking your train tickets via trainline.com because there are opportunities to get cheaper fares and our trains are extremely expensive. On a southern note, if you are going to Eastbourne, spare a bit of time and get up on the South Downs which aren't that far. Fantastic walking with sea on one side and lush valleys on the other. What fun! Autumn in England! I must admit to feeling a little left out of all the Nordstrom madness . I know we can order from the U.K. but I prefer to visit a shop & try things on . I do make a point of getting to the Margaret Howell sales at our local designer outlet . There's no ' to buy ' list though . It's very hit & miss with just one or two sizes of things . Frustrating , but I usually manage some shoppiness. This time it was a navy indigo twill ' work jacket ' without sleeves . Sounds odd but I think it will be a good addition to the wardrobe . I like your black cardigan-jacket . One piece of chocolate cake & three spoons – what's that about ? I share my cake with no one . You are never too old for chit-chat. I have just returned from late breakfast with an old friend who is visiting and it was glorious to have coffee, breakfast and then cake while we caught up on the past couple of months. I admire your orderly shopping and that white shirt especially. Thanks. I really like my new white shirt. Love the word, shoppiness!! And yes…we are never too old for chit-chat. I love this sale and already placed my order! Thanks Susan! Me too, Pam. Chris Brookmyre is pretty witty. Ah…thanks for saying that, Ali. It's too bad Nordstrom haven't made it to this side of the pond because I always make a beeline for it when in the US and heard a lot about the Anniversary sale. I didn't realise it was fall stuff – that makes it even more enticing because by this stage in summer I am fed up with summer clothes and wanting to soak up the fall (autumn) ranges which take forever to trickle into the shops. The fall stuff on sale early is the big draw for me. Although I'm not even close to being ready to think about my fall wardrobe yet. I may have to look for Max Mara when we're in the UK in the fall. It's pretty pricey here. I'm excited about England. But it'so hard to decide where to go and which places we won't have time to see. Re your visit to the U.K. There's a lovely small town called Bakewell ( famous for its sweet Bakewell Tart) which is handy for visiting Chatsworth. Also close by & walkable from Bakewell is this place , which I really recommend http://www.haddonhall.co.uk/ I think the nearest rail service would be to Sheffield then there are buses to Bakewell . Our public transport is pretty good & safe too . We all use it . Thanks so much, Wendy. I'll look into Bakewell… I think it was on my list… and Haddon Hall. So excited about the Mitford connection. Love the quote "shoppiness ensued" describes the situation perfectly… makes me smile! That easy conversation that we have with good friends where the words just flow and we can talk about most things … so precious. Like Patti I miss those late night sessions although I have on a couple of occasions stayed chatting with friends until 3 or 4 am at each others homes. We can then stroll home, as luckily we live fairly near to each other. Hope you're having a good week.I'm missing the sight and the sound of the sea! Hi Rosie. That seaside vacation must have been wonderful. Longtime lurker outing herself here.:-). I live midway between Bath and Salisbury so Bath is a favourite haunt for clothes shopping. Like all locals I've never done the touristy things but it's a lovely city. Re the Cotswolds people visit for the scenery and the quaint villages and towns. The popular ones are Stow-on-the-Wold, Bourton-on-the-Water, Moreton-in-Marsh and Castle Combe. Burford's nice as well. You'll have to use buses to get around as most of the train stations have closed. This site looks useful http://www.escapetothecotswolds.org.uk/visitor-info/gettinghere/ (Sorry can't do short links!). I used to work in London so may be able to help there – email if you want anymore info. It's exciting isn't it ! Thanks for this Sue. We were thinking of going to Cirencester. I read an article in The Guardian about the Cotswolds and the writer recommended Cirencester for first-timers to the Cotswolds. We were thinking of taking the train from Bath to Swindon and then going by bus to Cirencester. We'll be limited being without a car, that's for sure. I'm so used to travelling with my husband who can drive "on the wrong side of the road" with ease. Not me! I will definitely check out that link. Thanks. Cirencester's a lovely town and has some interesting history (it was an old Roman settlement) but I never think of it as "true Cotswolds". Have you considered getting a day tour from Bath. A quick search came up with Mad Max tours! The Cotswolds tour sounds good and the TripAdvisor reviews are OK. I'd agree with Sue re popular Cotswold villages and I'd add Broadway and Chipping Campden.Not sure how accessible they all are via public transport… if you've anywhere in mind I'm happy to try and find out for you. Thanks, Rosie. We are feeling the limitations in not feeling comfortable enough to rent a car. I do not want to drive on the left… I tried it once and it actually makes me dizzy. Any thoughts on Cirencester? Hi Sue, I've only visited once, years ago. Like Sue said it seems a lovely town but I tend to think the best parts of"the Cotswolds" as the smaller villages and towns mentioned and the countryside around them. I'll email you soon and see if I can help with anything. Great post! Nothing like girly chats about shopping, food, outings, books! It's the mulling over, contribuatory thoughts etc, it's like therapy to me. Thanks, Susan. My weekly walking group is finding the time very much like group therapy! We walk and whine about our husbands, then laugh and go for coffee. Good times! I was in Nordstroms last Saturday and women were lugging huge boxes of merchandise to the customer service kiosk dedicated to on-line returns. I was guilty of a few returns myself, but thankfully I didn't go crazy with my mouse. My sister and I are meeting in London on Sept. 2 for a three week vacation and I keep reminding myself that I don't need to travel with a brand new wardrobe. Love your new picks. I'm not a good on-line shopper… I never trust the photos to tell me the truth…and resent the rigmarole to return what doesn't suit. However… I will admit to buying that black jacket with my UK trip in mind. White shirt be right shirt ! And I had to comment re: Lafayette. 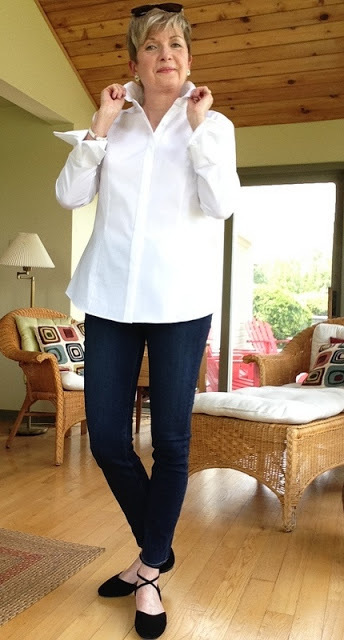 I discovered them at the Ann Sale a few years ago and found a white shirt I still love! It zips up the front with some stretch to the fabric and is tapered in a really flattering way. As well, I found two colors of T shirt that I still wear and love. Their clothing is really made well and flattering. Packages to open…what fun… like Christmas, but no hurt feelings if you want to return something. Beautiful classic look, Susan. Don't you love it when you find something is more affordable than you expected? Thanks for linking up with Fabulous Friday!